Running Away To The Circus, Wanna Come? I am in awe of people who write historical fiction. I don’t see myself as having that skill. But I do enjoy reading about history and discovering unusual details that help toss a bit of reality into my fantastical worlds. I find that combination of the real and surreal irresistible. While working on The Flying Jewel I’ve come across information about the circus I’d love to share. An example that still fills me with glee comes from the WPA’s Federal Writer’s Project. This program sent unemployed writers out across the country to interview people, creating a repository of details about American lives during the Depression. And whaddya know, they even spoke to some cirky folks. In one, a man who’d spent his whole life in the circus described starting off as a runner. His first job, to fetch a pound of lard from the butcher for one of the headliners. Apparently pork fat was very useful for removing makeup. Can’t you see it already? “Here you go son,” the butcher says, handing him the fat wrapped in brown paper and string. After the show, the kid walks nervously into the makeup tent placing the package by the mirror. The headliner digs his hand into the greasy substance leaving the imprint of his fingertips behind. He slathers it on his face, barking about some lighting cue that got screwed up. Maybe it’s summer and a fly settles on the fat’s surface? Before you can say Ladies and Gentlemen, Children of All Ages, the stuff has gone rancid. Never mind the stench though, can’t let it go to waste. He wipes the pancake away with a stained rag. Since my protagonist is female and in somewhat stranger circumstances the scene I wrote is different than what’s above. But that one detail inspired my whole prologue. I love mining for gold and discovering something so evocative. It kinda floats my boat and I hope you enjoy it too. 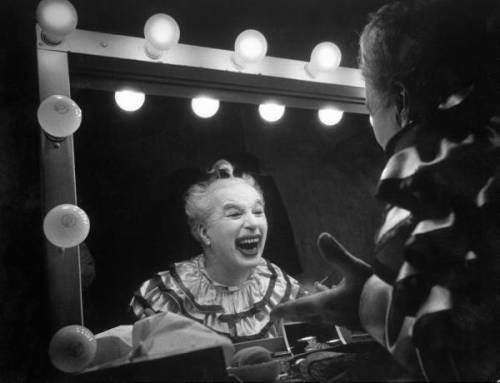 This entry was posted in Uncategorized and tagged circus, Federal Writer's Project, historical fiction, novel, research, The Depression, WPA, writing. Bookmark the permalink. 2 Responses to Running Away To The Circus, Wanna Come? What, everyone doesn’t use pork fat to remove their make up? Well excussssssse me, Noxzema girls. Oh please, Noxzema is so 1983. Just exfoliate with a hot pocket and you’re golden.